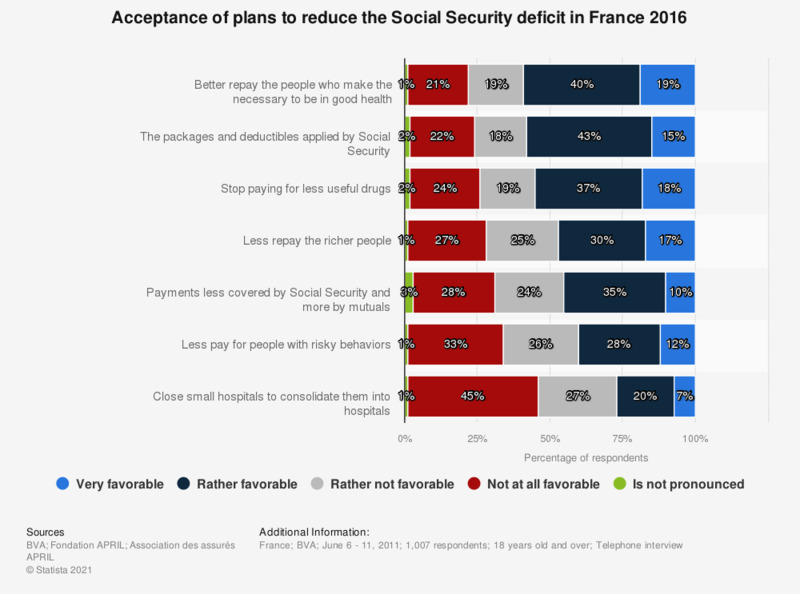 This statistic illustrates the opinion of the French on the various measures aimed at reducing the Social Security deficit in 2016. 37% of respondents were rather in favor of stopping the reimbursement of medications that were not very useful. The question was formulated by the source as follows: "For each of the following devices aimed at reducing the Social Security deficit, tell me if you are very, rather, rather not or not at all favorable:"
"Better repay the people who do the necessary to be in good health (ex: by practicing a sport)"
"The packages and deductibles applied by Social Security (eg the unpaid participation of 1 euro for each consultation at the general practitioner) "
" Do not repay any less useful drugs "
" Less repay the richer people "
" Refunds less supported by Social Security and more by mutuals "
" Less repaying people with risky behaviors (eg a high consumption of tobacco or alcohol) "